A blistering, head-stomping fight film from Timo Tjahjanto, one half of the Mo Brothers. Their 2016 film, Headshot, was a downbeat sucker-punch that upped the gross-out quota established by Gareth Evans in his The Raid films, helping to put Indonesian action on the map. This movie not only meets the high-bar previously set but – certainly in the case of Headshot – takes one jumping flying-kick over it. There are sequences in this film which will stay with you for months, making you gasp and wince all over again. But it is also the subtle touches that help to single-out this astonishing film: the eerie electronic soundscape which discreetly heightens the tension; the wonderful pacing and use of flashback; the easy, inherent camaraderie among the ‘brothers in arms’ and the intensity of the performances; its sly, multilingual tone which sets an ambitious target for mass, global appeal (the film was partly produced by California-based XYZ Films and released via Netflix). The film portrays a Jakarta on the rise: its booming urban sprawl providing a lucrative sideline for those individuals who slip between society’s cracks, like Ito (Joe Taslim) and his buddies. Ito has gone from petty hood to crazy killer, but has now had a change of heart after rescuing a young girl from a butchered village, taking her back to his home town and away from all the madness. His old sparring buddy, Arian (Iko Uwais), is sent by his Chinese Triad leaders to hunt down Ito and end his days, but will power corrupt their friendship, or will their brotherly loyalty win out? “This sounds like a gangster film”, says Arian’s English-speaking boss (played by Sunny Pang), and in many ways, the film is exactly that. However, it would be impossible to think of another gangster film which contains such extremes of grisly, wild, highly creative ultra-violence. Iko Uwais’ feverish choreography gleefully straddles the boundary between studious martial arts expressionism and slasher-filled horror, most notably during a fight sequence set in a blood-soaked meat factory complete with bench-saws, steel hooks, cleavers – you name it. For every grenade that explodes at point blank range, sending body pieces flying through the air, there is another more incidental act of pain: a finger trapped in a slammed door, a toe blown away by a bullet, a razor blade in the face; all of which has been designed expertly for maximum recoil, and working seamlessly into the film’s glorious poetry of violence. And then, to top it all off, Iko Uwais and Joe Taslim conclude proceedings with an exemplary display of silat-inspired blocking, counter-attacking, take-downs and legwork which proves how the film has substance as well as shock. The result is very effective, and a sublime distillation of a cast and crew at the top of their game. 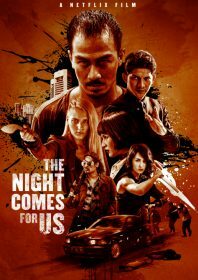 The Night Comes for Us is available on Netflix. I have yet to see a movie that equals the “grisly, wild, highly creative ultra-violence” of this film. It was so intense, I am waiting a while until I see it again. I would most definitely rate the action of this film the highest rating possible.